Hey, follow our blog, why don't 'cha? 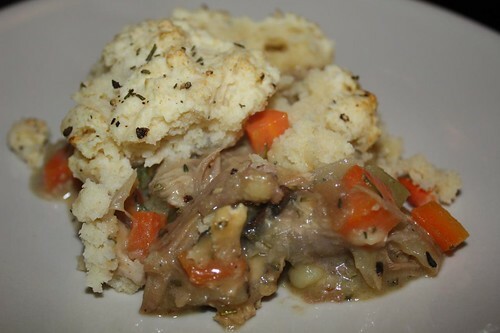 If you do, we might share some of last night's biscuit-crusted turkey pot pie with you! After using up all the turkey it was time to take using up the leftovers to the next absurd level. I had made these potato wedges the day after Thanksgiving to accompany our hot turkey sandwiches. Now I was tasked with turning those into something lest they be left to rot in the fridge. The thing about the potato wedges is they are so delicious when they're hot out of the oven and so nasty eaten cold. This said by someone who has virtually no qualms about eating anything cold out of the fridge. 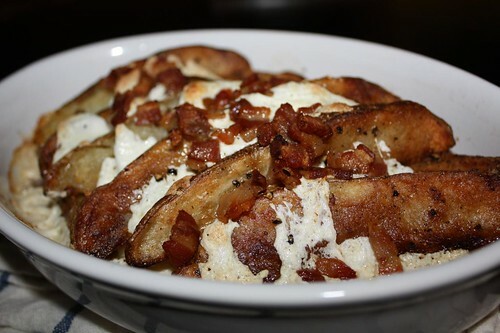 In order to let these potato go down honorably I decided to crisp up some bacon, warm them quickly in the pan, then top them with mozzarella and bake them in the oven. The result was pretty fantastic. The best part was avoiding that inevitable moment in a few days where I would have to throw the wedges in the garbage because they had crossed that line where the smell they emitted outweighed the guilt of throwing them away unused. great use of the potato wedges. Will steal shamelessly, especially if I figure out how to replace the esential ingredient, bacon, with something that the "veggies' will like.